Constructed with lightweight (0.10mm) PVC. Rear mesh vents for breathe-ability. Jacket, elastic waist pants, and detachable drawstring hood. 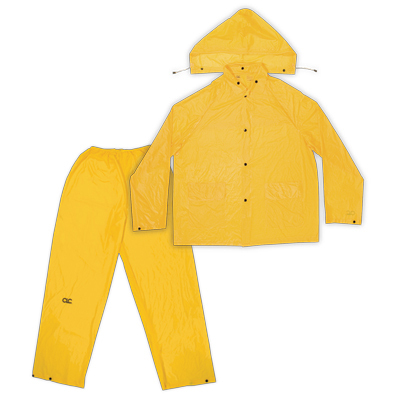 CLC Climate Gear™ and rainwear is covered by a limited lifetime warranty against defects in material and workmanship for the normal life of the product. This warranty does not cover normal wear, abuse, accidents, neglect, or damage caused by use of the product for a purpose other than intended.